The Pacific War Online Encyclopedia: Collins, John A. Sir John Collins served with the Grand Fleet from 1914-1918. 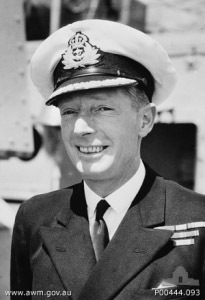 He commanded the light cruiser Sydney during the Abyssinian crisis in 1935-1937 and again, after a stint with the Australian naval staff, in 1939-1941, participating in the Battle of Cape Spada in June 1940. He commanded the Australian Squadron from mid-1944 and was seriously wounded in a kamikaze attack at Leyte, for which he was awarded the U.S. Legion of Merit.